In 1911, the UVA School of Law relocated from the Rotunda to Minor Hall, a building designed to meet the school’s growing needs. When a Law School alumnus came back to visit Grounds in 1916, the school’s move so distressed him that the poor man “never did look at the new building, but hurried away to look at the old,” this magazine reported. Anxiety is the ever-present companion of change at Mr. Jefferson’s University. Its designation as a UNESCO World Heritage Site speaks to the enduring magnificence and authenticity of its Academical Village. But UVA is not Machu Picchu, an abandoned relic. As the University has developed, it has had to confront, like no other university, the paradox of evolving while remaining unchanged. Perhaps no development evoked this tension more than the creation of the North Grounds. 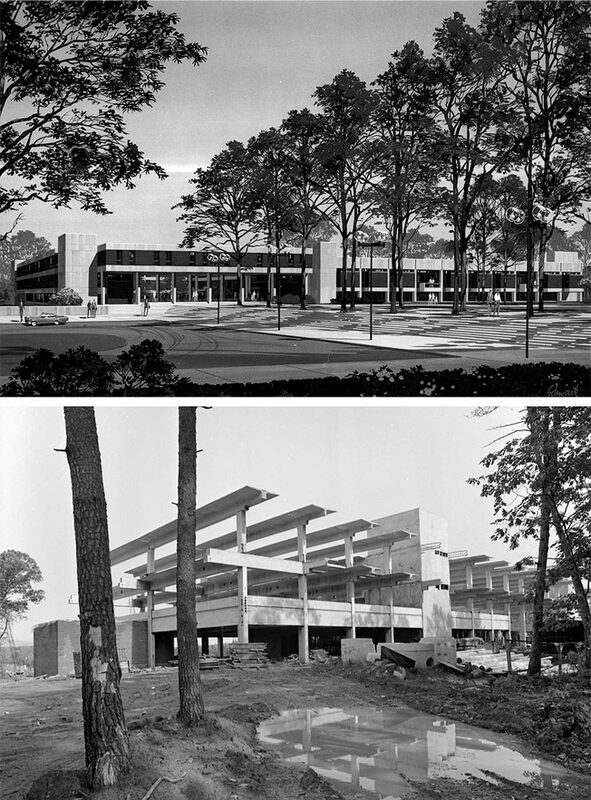 The modernist structures built in the mid-1970s for the School of Law, Graduate Business School (later renamed Darden) and the Judge Advocate General’s School drew intense criticism from students and faculty, who worried about the ahistoricism of the buildings as well as the distance from the schools to Central Grounds. 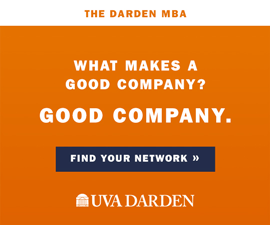 The design of the Darden School of Business campus, built in 1992, while neo-Jeffersonian, was not fully accepted by the University community, either. 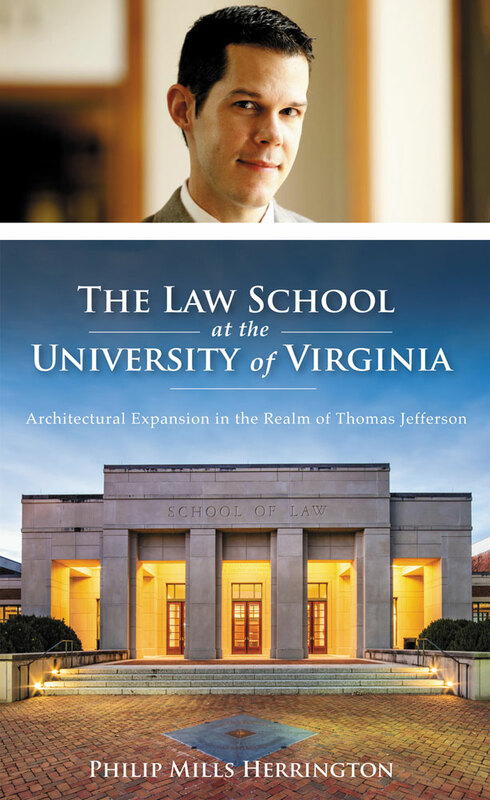 In his new book, The Law School at the University of Virginia: Architectural Expansion in the Realm of Thomas Jefferson, Philip Herrington (Grad ’07, ’12) examines what he calls “the push-pull between old and new” of the University’s history. He devotes half his book—which chronicles the migration of the Law School from the Rotunda to its current home—to the era when the Law, Darden and JAG schools all staked their futures on a move away from Central Grounds. 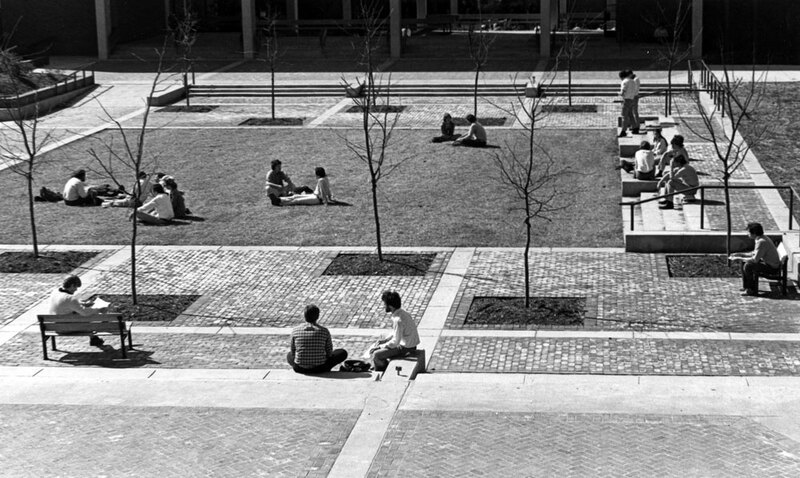 The Jeffersonian vision of the University is deeply tied to the physical space he designed: the Academical Village with a series of 10 pavilions housing faculty and classrooms attached to rows of students’ quarters and joined by an inward-facing colonnade. At its center is a common outdoor space, the Lawn, and at its head a library within the Rotunda, inspired by the Roman Pantheon. In Herrington’s account, the University contended with these pressures as it developed North Grounds. The property was originally a farm called Sunnyside, “one of the last surviving fragments of the rural landscape that once surrounded the University of Virginia.” In 1945, UVA purchased a farm just to Sunnyside’s south to house returning veterans. Shortly after that came the opening of the Barracks Road Shopping Center and the construction of the Charlottesville bypass. Change pressed in from all sides. 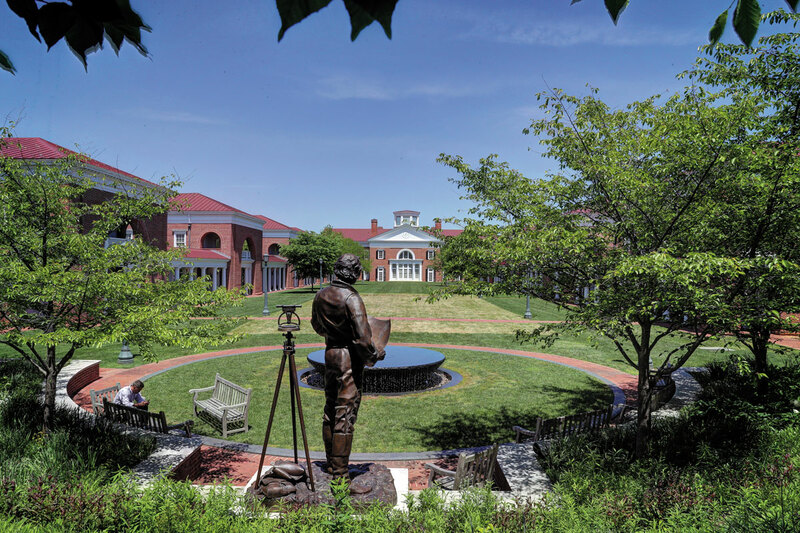 During this era, UVA gave itself the option to create what it would come to envision as a new business–law complex. Soaring enrollment, as baby boomers began to hit college age, drove the change. Spurred in part by Virginia’s General Assembly, UVA’s student body doubled from 5,000 to 10,000 between 1960 and 1970, and by 1975 would hit 15,000. This same era saw an expansion of minority enrollment and, in 1970, the enrollment of the first female undergraduates. Reality intervened when the Board of Visitors realized that plans to expand the Law School and the Graduate Business School on Grounds were incompatible with enrollment projections. The schools needed more space and, as graduate programs, were obvious candidates for moving farther from the Academical Village. Their respective deans, Hardy Cross Dillard of the Law School and Charles C. Abbott of the Graduate Business School, saw in their mutual dilemma a mutual possibility: By moving to the Sunnyside property, purchased by the University in 1963, in tandem and adjacent to each other, they could “promote a ‘cooperation of faculty and intermingling of student bodies’ that would be ‘virtually without precedent in the educational world,’” Herrington writes, quoting a memorandum of understanding. The law and business buildings—and a nearby building for the JAG School, which trains military attorneys—went up at “the tail end of a wave of modernism at UVA,” says Hogg. Nearly as soon as students began to occupy the new buildings, two forces emerged that would again reshape the North Grounds and its relationship to the rest of the University. The first was the arrival of postmodern architecture, which revived interest in historic precedents. The second was the evolution of sophisticated fundraising operations in the law and business schools that made realizing grander and more expensive visions possible. The Law School chose the path of renovation, acquiring the former Darden building and developing a plan with the firm Ayers Saint Gross of Baltimore that joined the two existing structures with a central pavilion and closed in the central outdoor mall. “The new construction was classical,” writes Herrington, “but it was the stripped, blocky classicism of many 1930s commercial buildings. … There were no curves, decorative capitals, or dentils, and no white,” choices that helped the new construction better blend with the existing buildings. It also included elements that deliberately recalled Clark Hall, the home the law school abandoned. Philip Herrington’s (Grad ’07, ’12) new book explores the “push-pull between old and new” at UVA. The JAG building remains much as it was first constructed. Together, the three complexes make up the academic core of today’s North Grounds. Once a commuter outpost, it now features mature landscaping. Several generations of students and faculty have spent careers there. The North Grounds’ relationship to the Rotunda and all it represents remains a work in progress. In August, the University announced plans to improve a pedestrian and bicycle shared-use path along Ivy Road in an effort to improve connections between the North and Central Grounds. The Academical Village that Jefferson designed to serve several hundred students in the early 1800s remains UVA’s foundational point of reference. 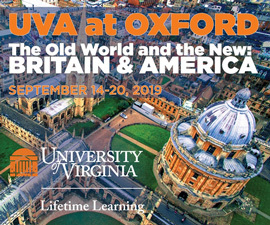 University leaders and planners can push toward, pull from, and have a thousand splintered attitudes about this reference, but UVA will never know what it is like not to have it. Decisions driven by developing needs, made in times of changing tastes, will continue to be measured against evolving understandings of it. Looking back. Looking forward. Janus endures in our time, too. Matthew Dewald is a writer and editor based in Richmond, Virginia.